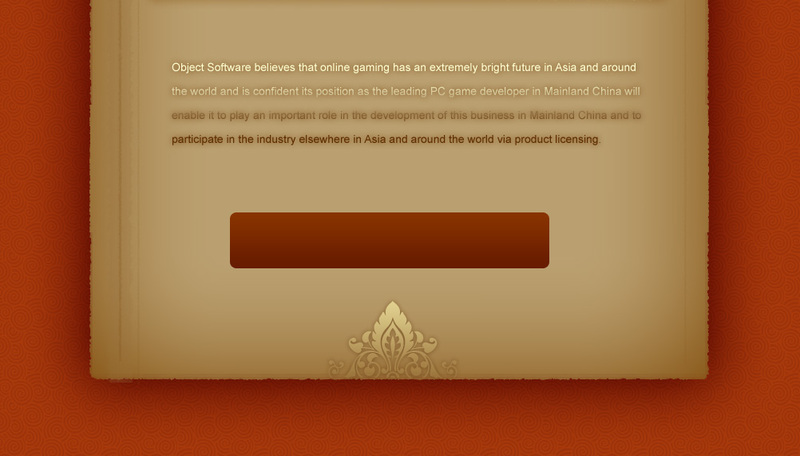 Object Software Limited is a developer of entertainment software for the PC and through its affiliate, Beijing Object Online Technology Corporation ("Object Online"), an operator in Mainland China of online PC games. Through its wholly owned subsidiary, Object Software (Beijing) Co., Ltd, it operates a development studio in the Haidian District of Beijing with a staff of over 150. Since its inception in 1995 it has developed six single player PC games which are "Hooves of Thunder"(1995), "Metal Knight"(1998), "Fate of the Dragon"(2000), "Dragon Throne: Battle of Red Cliffs,ぴ(2001) Prince of Qin,ぴ(2002) and "Seal of Evil,"(2004) and four online PC games titled "World of Qin" (2003), "World of Qin 2"(2005), Dragon Throne Online (2006) and "World of Qin 2: Phoenix Dancing" (2006). All these 4 online games are being operated in Mainland China by Object Online. the name "Feng Wu Tianjiao" at http://fw.object.com.cn/. and Switzerland and by Strategy First Inc. in North America. RPG Codex as one of its favourite games of 2002.
markets and South East Asia. United Kingdom, which also awarded the game an 86% rating. of PopSoft, the leading PC game magazine in Mainland China. Taiwan and Hong Kong and in the United States and Italy. Powered By Prime Square Technologies Ltd.